Front Populaire is currently the northern terminus of Line 12 of the Paris Métro. The station opened on 18 December 2012. It is situated on the Place du Front Populaire in Aubervilliers on the border with Saint-Denis, and its primary entrance is on the Rue des Fillettes. It was the 301st station to open. Construction is underway to extend Line 12 from Front Populaire, adding the Mairie d'Aubervilliers station and the Aimé Césaire stations in Aubervilliers, to open in 2019. 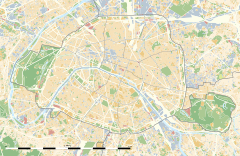 Wikimedia Commons has media related to Front Populaire (Paris Metro). This article related to the Paris Métro is a stub. You can help Wikipedia by expanding it.